"Wish for a dinosaur and watch all your dreams come true." We're Back! A Dinosaur's Story is a movie that explains why a once frightening dinosaur is now playing golf. It begins with a group of dinosaurs that are fed a cereal that makes them more intelligent. They are then instructed to find Dr. Bleeb so that they can interact with children at the Museum of Natural History. With the help of two discouraged children, they set out on a mission to the museum. However, when the kids meet Professor Screweyes and his Eccentric Circus, the plans go in disarray, and it is now up to the dinosaurs to fix everything. We're Back! 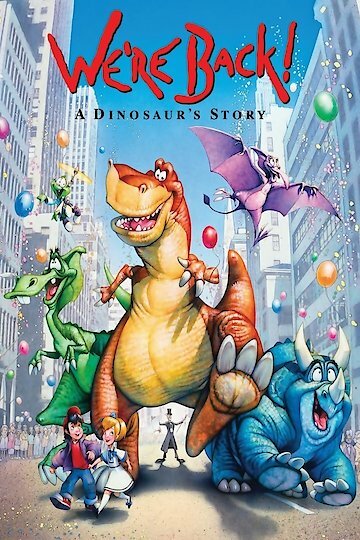 A Dinosaur's Story is currently available to watch and stream, download, buy on demand at Netflix, Amazon, Vudu, Google Play, FandangoNow, iTunes, YouTube VOD online.